Enjoy your photos being placed on a world map in a fascinating way. PhotoMap helps you finding and visiting great or important places again. It enables you to describe beautiful moments by adding photo captions or writing in a diary. Relive your trips by jumping virtually from location to location. PhotoMap presents your pictures where you took them. Create beautiful geo photo collages. You can easily share them to show your partner, friends and colleagues where you have been, whether on vacation, at the weekend, on an excursion, on a business trip, or just on a usual day. ✈ Share your photos via link. Friends can view them in a browser, even on a Windows PC or iOS device. If your photos don't have geo positions until now, please activate the "store location" option in your camera app. I recommend using the app MapCam to take pictures with precise geo positions. ✔ Create geo photo collages. ✔ Track your trips with the integrated geo tracker. 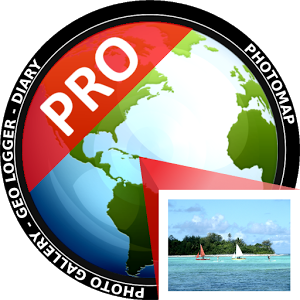 ✔ Change the location of your photos via drag and drop or add geo coordinates to photos (Geotagging). ✔ Store photo captions in your photos' metadata. Picasa and other tools on your PC can read it. ✔ Use the built-in camera starter to take pictures with precise geographical coordinates. ✔ Share your photos and geo photo collages via Facebook, Instagram, Twitter etc. PhotoMap is interesting for the following groups: real estate brokers, geologists, inspectors, rangers, craftsmen, firefighters, reporters, police officers, postmen, architects, backpackers, travelers, construction workers, truck drivers, taxi drivers, event managers, stewardesses, guest representatives, actors, facility managers, au pairs, tourism assistants, farmers, foresters, gardeners, insurance agents, soldiers, janitors, pilots, doctors, interior designers, city guides, models, etc. ✔ Faster calculation of distances that are displayed on time-based groups: Diary, Trips, Last, Days, Weeks, Months, Years, and Lookback. Hint: The geo logging needs to be activated to record distances.